People, sea, an island... the idealized, mythical image of vacation can be spoiled only by the dissatisfaction with what was received in relation to what was invested, something capitalism calls "value for money". The average citizen always promises to sock away a part of their salary every month in order to afford a vacation on an island, surrounded by sea and nature, instead of a week of swimming on crowded city beaches. Maybe on Vis, Korčula or even Lastovo, and she is ready, when the time comes to return to the city’s everyday life, to pay for a ferry ticket to the island and back that amounts to one loan instalment. And so numerous articles in the expanses of the internet explain and advise us on how to save two, four or even six thousand kunas by the time the next summer vacation rolls round, all the while ignoring the fact that, in reality, the average citizen’s every moneysaving tactic is doomed to failure, and that a weeklong vacation anywhere is a privilege, not the standard. But what we look for in those couple of days is an indigenous, authentic, original experience, forgetting that we can only have this if we visit the pastoral area in the ten months when "record number of visitors" is not the biggest story on the evening news. Only when, instead of the tourist simulacrum of the island and islandness "which masks and distorts deep reality" (according to Baudrillard), and instead of "bad semblance with a touch of magic" (same), we try to look at the island in its entirety, a shift in perspective is possible. As a counterpoint to the idealized tourist image, the sociological perspective emphasizes those aspects of the island that are obscured by tourism offers. In their book Cities Sunk The Islands - Changes in Small Island Communities, Sonja Podgorelec and Sanja Klempić Bogadi define the island as a socially constructed reality dominated by a sense of isolation, separation, diversity and otherness, and islandness as a dynamic and complex social construct determined by the characteristics of topography, climate, island’s accommodation, size, the experiences of relations between center and periphery, the connection with the local island culture and the existence of the island's identity. The problems related to living on an island are complex, and whether to stay or leave is a question answered by a blend of political, economic, social and cultural factors, infrastructural problems and the country’s structural insensitivity towards its own citizens. Instead of improving transport links with the mainland, stimulating the economy, supporting sustainable tourism that doesn’t disrupt the island’s ecosystem and strategic long-term investments that would improve the island's infrastructure, the government leaves people on the islands to their own devices. Therefore, both staying and leaving requires courage, and a conscious decision about how to further structure one’s life. But it is also hard to ignore certain advantages that the island offers its residents. At the crossroads of being isolated and ignored by the country that should find methods of solving the problems of island communities, and natural beauty, pleasant climate, safety and community cohesion, at the point where these converge - life takes place, and islandness is constructed. According to the book Desired Destinations, Lonely Locations: Insights in Culture and Developement of the Croatian Islands edited by Ines Prica and Željka Jelavić, islandness is described as a "spatial, temporal and experiential duality (...) a multiplicity of perspectives, sensations and experiences." But as long as we follow and consume various forms of tourism offers in the foreground, we won’t be able to see and understand the authenticity that remains hidden in the background. A similar thing is happening in the field of culture: tourism is excellent at co-opting various forms of art and cultural activities by putting its resources and infrastructure at their disposal, and consequently gaining in value. 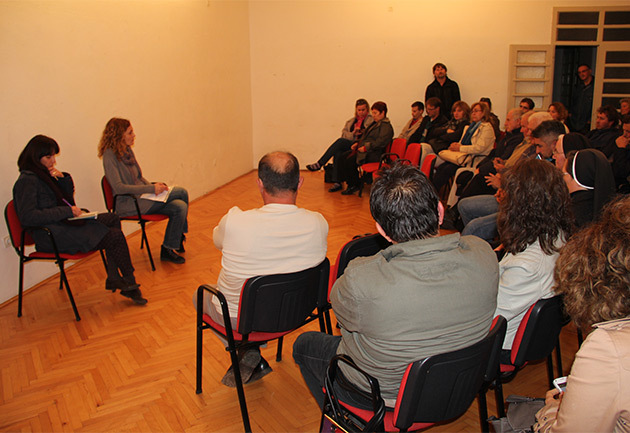 European funds, the Ministry of Culture, as well as local government funding, all direct a part of their budget specifically to various forms of art and cultural production with the aim of art decentralization, or the production of certain forms of cultural and art content in small isolated communities. Therefore, different art practices choose geographically, economically, politically or culturally isolated areas and marginal communities for their work, and islands have turned out to be particularly interesting in recent years, especially in the context of combining tourism and art. On the one hand, art production often uses them through a tourist exploitation of their capacity, so they become venues for art colonies, residencies, festivals and similar events. But the result, whether the thing in question is an exhibition or a cultural event, and even when it is presented on the island and uses the island’s resources, often doesn’t speak to the island’s residents, or only touches upon them sporadically, so these activities remain independent from the island’s life, its specificities, needs and contexts. In other words, while gaining legitimacy precisely because they bring a certain kind of culture or art content that is lacking on the island, they exclude the island from its own activity or approach it from a patronizing position. In addition to the problem of instrumentalizing local context, space or population, there is the question of the point of such activities, primarily – who are they directed at, designed for, useful for? This may prove to be crucial in the analysis of those art practices in the context of islandness that manage to subvert the one-dimensional tourist perspective of it. One of them is the project Islandness - People Surrounded by Sea, a three-year interdisciplinary program of the NGO MAPA that the artist Andreja Kulunčić and art historian Irena Bekić intend to develop until 2017. We can interpret the project in relation to the years-long work of Andreja Kulunčić within the field of art and social practice: it is engaged, but not populist, sensitive, but not sentimental towards the experiences of a certain marginalized social group. 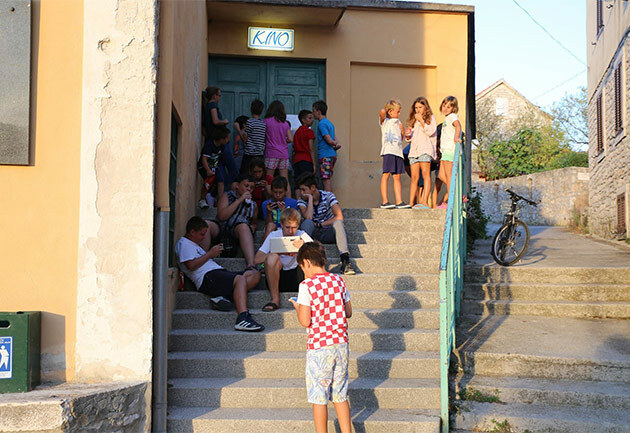 At the heart of the project are "people surrounded by the sea", with a focus on the relationship between the individual and the community in the context of spatial, economic, social and cultural isolation. A special feature that springs from islandness, as a geographical and sociological reality, is articulated in interaction with the inhabitants of Vis, Lastovo and Mljet through several connected segments: movies Lastovo, Komiža and Mljet, as a sort of ethnographic and participatory method based on field research and interviews with islanders, a workshop program and a final artist production. Methodologically and conceptually, the films are products of the first stage, but also the material for further processing and for art production that should be participatory and activating, with the aim of including the island's population that takes part in the development of the piece on all three islands, but also, in the end, the non-island audience. Intersecting in the films are several perspectives: that of the artist as a stranger and tourist within a specific geographic space, that of the islanders as hosts to the artist, participants in the art process and work, interlocutors, and, at a certain point, the audience, and that of the non-island audience. Some of the topics, such as tourism, fishing, transport isolation or winter on the island, are specific to island life, while problems like emigration, closing factories or housing represent a point of converging experiences of insecurity, precariousness and uncertainty of everyday life, which are relevant regardless of geographic coordinates. Particularly interesting is the double position of the librarian from Komiža: she is a part of the island community, but at the same time doesn’t belong to it, and is perceived as a person who is both near and far, who’s from the outside, but also part of the group in which she is both marginalized and integrated. Marginalized because she doesn’t belong, and integrated because she has been assigned specific tasks and social functions. The other (film) perspective offered by the island could be providing a clearer picture of what is simultaneously going on in cities and many contemporary environments that, at first glance, have nothing in common with the island's fate. A different approach to the context of the island is offered by the audio-visual art festival Vizura Aperta / The View of the Island. The festival, which took place in Momjan for the past 15 years, is relocating to the island of Zlarin this year, and its chosen central theme is tourism, which includes questions about unplanned construction, neglect of the island, emigration and the consequent disappearance of the indigenous way of life. The program includes exhibitions, workshops, interventions in public space, screenings and public presentation of workshop results and processes. Displacing the festival to Zlarin raises questions about the possibilities of “a museum on an island ... an island that is a museum”, and whether it is possible, and to what extent, to involve the island’s population and get them interested in the events, while not denying the possibility that the festival could fall into “the trap of the phenomenon known as culture tourism”. 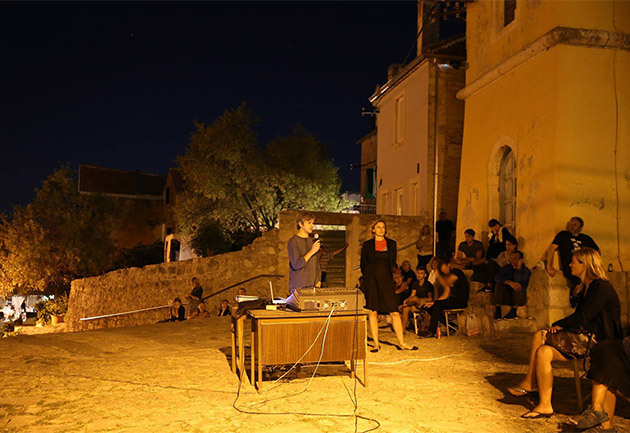 Although conceptually firmly anchored in the space-time context to which it orients itself and in which it operates, the target audience are not primarily the residents of the island: using art as a link between artists, experts from various fields, students, children, tourists, and urging islanders’ participation, the festival emphasizes networking and cooperation between different social groups more than it focuses on the island's population. An interesting critique of the festival thus comes from within the festival itself: the artist Igor Grubić believes that it didn’t communicate the program to the locals well enough. He himself, in interviews with the islanders, detects the island’s problematic spots and intervenes: the exposed asbestos boards in the cinema, the offensive graffiti on a public surface and the inadequately installed lightning rods on the playground. Grubić says that this does not complete his work because, parallel to the interventions, he compiles a list of problems the islanders meet in order to share them with the responsible authority. Other artist doing work that can bring about positive change in the local community are Daria Štrelov and Vlatko Paulić, who got the cinema in Zlarin up and running and launched film screenings, while the workshop Public Zlarin or Spaces of Zlarin’s Everyday Life started with the idea of serving as a base detecting and encouraging future interventions within the island’s space in order to improve life on the island. Combining a variety of different media, methods, practices and forms of action, the festival has managed to achieve positive social changes on the island and offer art and artistic practices as a possible path towards new visions of the island. Instances of sociological and anthropological research related to the topic of island and islandness give a broad insight and guidelines for the issue within the scientific discourse in which they are created, but, despite their importance and relevance to the subject, they can hardly have wider social reach, unless their results are communicated to the public. The field of art, on the other hand, is not strictly defined by methodology and approach, and has the freedom to borrow, adapt, create and find strategies that can draw attention to certain problems. In this sense, the advantage of art practices stems from the freedom of the codes which form them and which they use to articulate topics, as well as from the ways they mediate and communicate their positions to the audience. "Only another perspective has the complete sense of the reality of an historical experience," says Baudrillard. While the festival of audio-visual arts Vizura Aperta enriches the social space, invigorates it and activates it, introduces new perspectives through new content and expands the island’s offering with art productions, workshops and meetings, the project Islandness – people surrounded by sea approaches the topic of island and islandness from a different angle, a more intimate and immediate one, so it manages to explore and communicate the slippery, elusive nature of the island. In doing so, its practices and methodologies don’t conquer the space of the island, don’t give it new meanings, don’t define it, nor subordinate it, but illuminate it and purge it of the mythology of tourist legends and expectations: by giving a voice to its people, they simply represent it. Both projects, although different in sensibility, offer another look at the island as the "desired destination, lonely location", position it in real time and space, and place it in a relationship with other spaces, making the hues of the island's everyday life visible and new forms of action possible, those that usually remain hidden behind the traditional tourist attractions.